This salad should be called Christmas salad because it has all of the classic Christmas colors, Red, Green and White. Red” from the Watermelon Radish, “Green” from the Cucumber and Avocado and “White” from the Garlic and Herb Goat Cheese. I recently stopped at Nicolet Farms to see if they had horseradish root. I found potatoes, beets, onions, and a a few other root vegetables instead. They didn’t have any horseradish root but they did have black radishes and watermelon radish. I picked up a watermelon radish, a “new” to me vegetable. A watermelon radish is a root vegetable. It’s an heirloom Chinese Daikon radish and a member of the mustard family. It ranges in size from a golf ball to that of a soft ball. 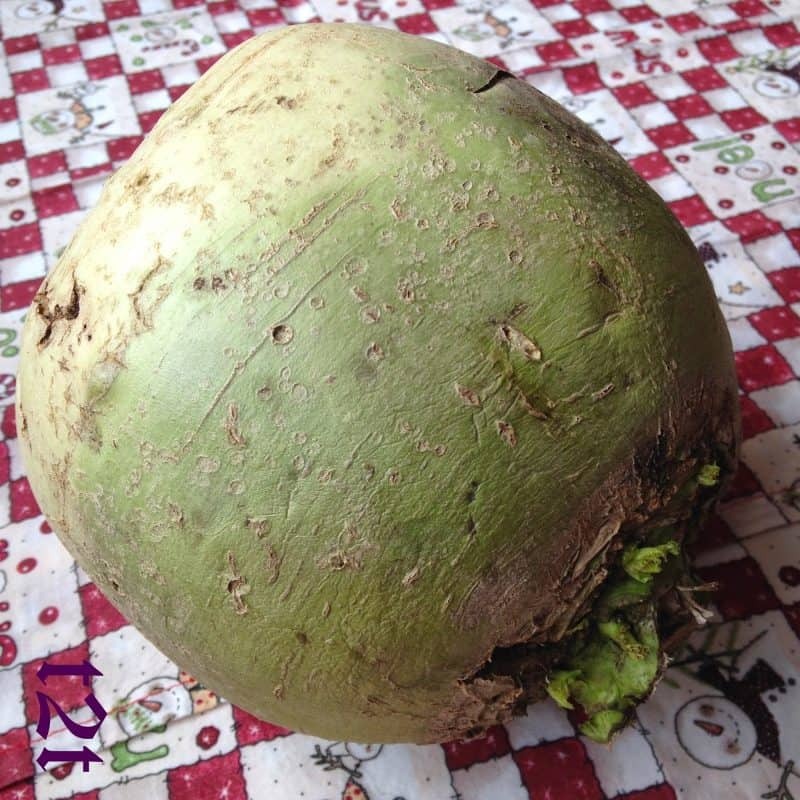 The radish I purchased is the size of a large soft ball! Sometimes called “Rose Heart Radish” or “Red Meat Radish.” they’re available year round, but are most commonly available in spring or late fall. Watermelon radish are creamy white to light celery green on the outside and the inside has a rose to magenta color. Even though it’s called watermelon radish, it doesn’t taste like watermelon. It’s called watermelon due to it’s color contrast, which is similar to that of a watermelon. 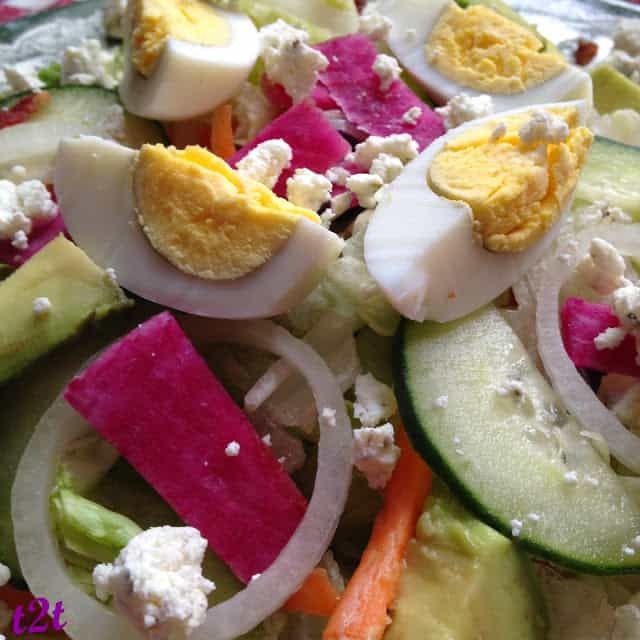 Sweet, crisp, refreshing, this new to me radish adds a splash of color to any salad. Watermelon radish has a mild, earthy flavor with only a slight peppery taste. It has a smooth crisp texture and a nice crunch. It can be served fresh or cooked, hot or cold. 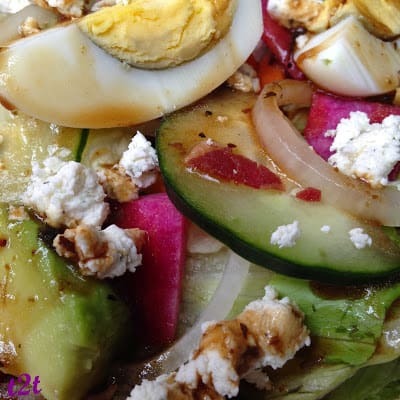 Watermelon radish pairs well with fennel, apple, feta, chevre, bacon, white fish, cucumbers, mild salad greens, cooked eggs and vinaigrette. 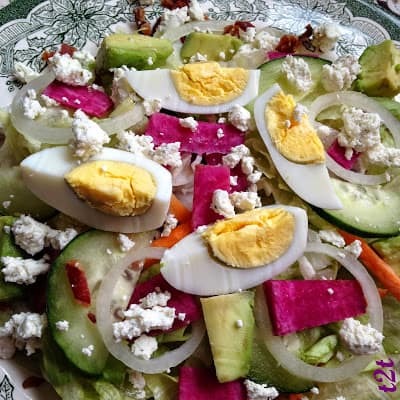 avocado adds a nice creaminess, garlic and herb goat cheese adds a wonderful tang, bacon adds a rich smokiness and the crunchiness comes from the sliced onions, watermelon radish and cucumber. For me, egg wedges are a must on any salad. Divide salad mix between 4 serving plates. 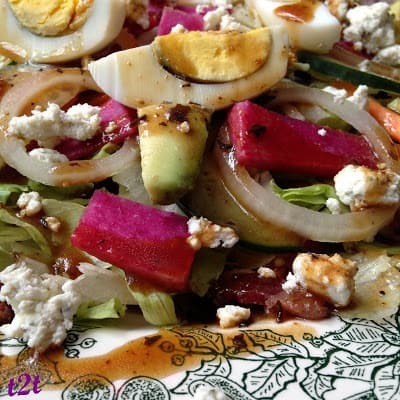 Top salad greens with onions watermelon radish, avocado and cucumber. Divide crumbled bacon between plates, roughly 2 slices per serving. 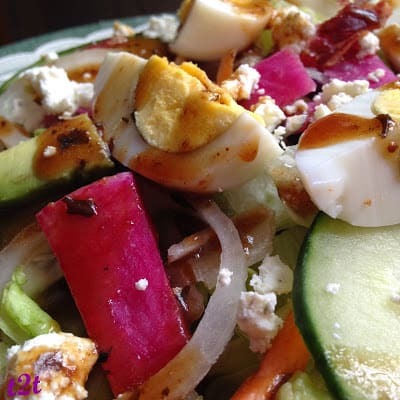 Top salads with 1 quartered egg per serving, top each serving with crumbled garlic and herb goat cheese. 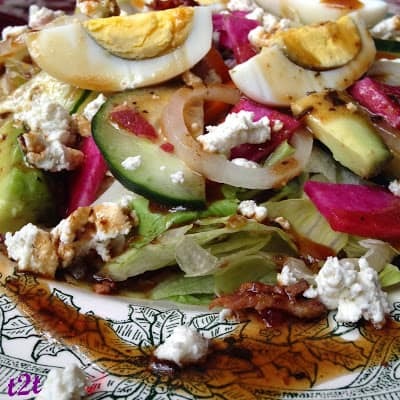 Serve with a Balsamic Vinaigrette or Vinaigrette of your choice. I tried black radishes last year. I'm going to look for the watermelon one.. love trying new vegetables. Great looking salad. Thanks so much for bringing this to Weekend Bites. Your Christmas Salad looks delicious, I love all the ingredients. Thanks so much for sharing with Full Plate Thursday this week. Hope you have a great weekend and come back soon!